Provides media server functionality as well as enterprise telephony (SIP) connectivity between Google Dialogflow Enterprise Edition and your enterprise telephony components (PBX or SBC). The USAN Dialogflow Enterprise Telephony Gateway (Developer Edition) allows Google Dialogflow Enterprise Edition users to easily connect to their projects from existing phone numbers and enterprise telephony networks. The Developer Edition is a free tool for developers to kickstart their Conversation IVR projects. Full Enterprise Edition available soon. 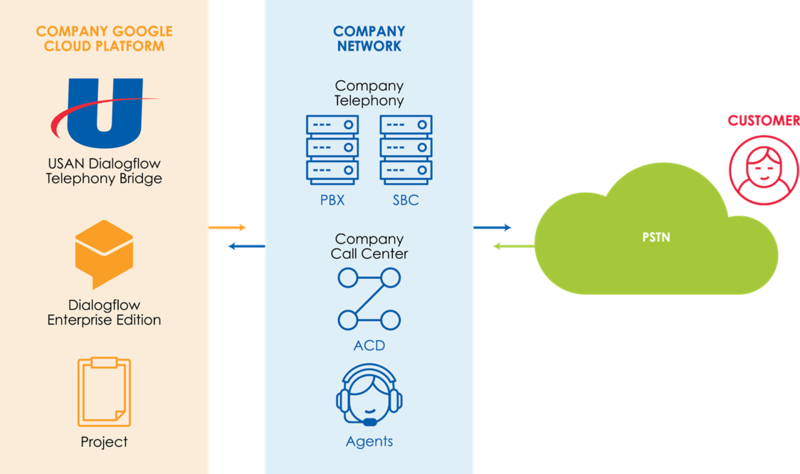 The solution connects to corporate PBXs and SBCs via SIP/RTP and provides a bridging gateway function into the Google Dialogflow Enterpirse Edition voice API. The solution provides the necessary services to enable managing the end pointing of the voice on the RTP circuit, forwarding the voice utterances to Dialogflow Enterprise Edition, managing playing of voice files to the RTP circuit, and managing the transfers back to the Corporate Telephony network via SIP. The USAN Dialogflow Enterprise Edition Telephony Gateway drives rapid business value at low risk by allowing enterprises to quickly adopt cutting edge conversational speech and public cloud bot technologies in their day to day voice self service while minimizing the risk and transition cost of adoption. Learn how USAN’s Visual IVR for Amazon Connect offers your customers mobile web self-service options. Connects existing corporate telephony assets (phone numbers, PBXs, SBCs) to Google Dialogflow Enterprise Edition. Provides media server services to the call while being serviced by Google Dialogflow Enterprise Edition. 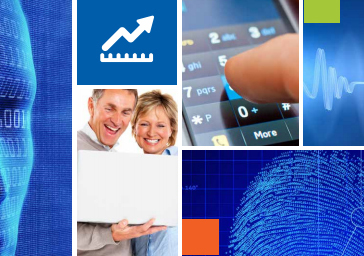 Manages call transfers back into the corporate network if needed. Improved Customer Experience – brings familiar conversational speech interactions to the traditional enterprise IVR. Increased Call Containment – richer interaction capabilities and improved usability means customers will enjoy the self-service experience and will “zero out” to an agent less frequently. Easy deployment and integration using Google standard tools. A top 10 global bank developed over 40 separate self-serve applications across a multi-decade relationship with USAN. Utilizing voice self-service best practices, USAN and the bank were able to achieve containment rates ranging from 45-89%. However, in a continuous improvement initiative, the bank wanted to boost its self-service numbers further, while at the same time increasing customer satisfaction. Orchestrate the customer journey across every channel, simply and automatically. Motivate and empower your workforce to achieve more.